A new app, named Google Go, has been launched to give the unified Google experience to Internet users on low-end handsets. The app provides access to Google services such as Search, Voice Search, GIFs, YouTube, Translate, and Maps and includes a search bar to provide a unified experience. Google Go also offers search trends and top stories from the Web on any particular topics. It was launched by the company at its Google for India event on Tuesday. Also announced was the Android Oreo (Go Edition) for entry-level smartphones, as well as the official launch of Files Go. Apart from Google services, the new Go app provides users access to Facebook, CricBuzz, and Instagram. It includes a button that helps users translate their search queries with one tap. 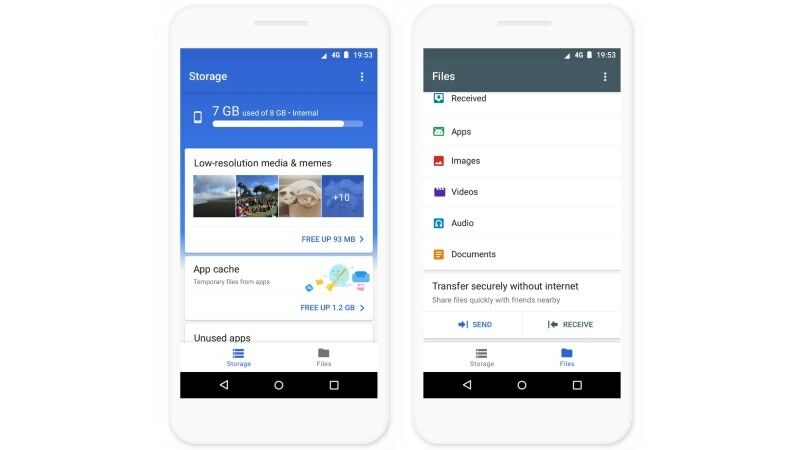 Weighing less than 5MB size, Google Go consumes 40 percent less data and is optimised for devices with less than 1GB of RAM. It will be available for download for all Android devices starting Tuesday and will come pre-installed on Android Go devices. For smartphones with 512MB-1GB of RAM, Google announced Oreo Go, a version of Android 8.0 Oreo optimised for low-end smartphones. It will become available over the next few months, while its code is now available for developers through Android 8.1. Devices running on Oreo Go will have an average 15 percent faster app startup time, the company said, and preloaded apps will be optimised will take up 50 percent less space on the available storage. Google said an average Oreo Go device will be able to store an extra 1,000 photos with these optimisations. “Android Oreo (Go edition) will help improve the experience on entry-level phones while new apps like Files Go will ensure their experience is smooth and they consume less data,” Caesar Sengupta, Vice-President, Next Billion Users, said. He told PTI that he expects handset makers to bring smartphones based on Android Oreo (Go) edition in early 2018. Oreo Go will come with get the same security features as available on the standard version, including Google Play Protect. Go edition devices will come with Data Saver features active by default. The users will be able to download any apps, but there is a new section that includes optimised apps especially for the Go edition devices, such as Facebook Lite and Flipkart. Google apps have been worked upon as well to work better on low-end devices, and the Go versions of Assistant, Gmail, Chrome, Search, Maps, YouTube, and Gboard will be preloaded on all Oreo Go devices. Apart from Google Go and Oreo Go, the Files Go app was officially launched at the event, after being spotted in testing last month, and will also be pre-installed on Go edition devices. It has been custom built for Go edition devices and helps free up space on the phone, find files faster, and share files offline with people in the vicinity. The app prompts users to delete heavy files or files from a particular sources (for example, WhatsApp), and allows them to delete the said files in just two taps. With advances in computer vision, the Files Go app will let users delete certain images (such as images received in ‘good morning’ messages on instant messaging apps). It will also let users create a closed network accessible only by approved smartphones in the vicinity to share files by creating a hotspot, which the company says is 200 times faster than Bluetooth transfers. Files Go is also designed to help users find files faster, by segregating files by type and allowing quick uploads to the cloud. A special edition of Google Assistant was also announced for the Jio Phone at the event, the first AI-based digital assistant for a feature phone.